In this game, each player is a livestock farmer. The goal is to see how well each farmer can adjust their farming decisions based on seasonal forecasts. At the end of the game, participants should understand the possible uses and limitations of these forecasts, their personal risk-taking preferences, and how seasonal forecasts can affect livelihood decisions. Tweak the narrative to make the context appropriate and relevant for your players (see examples overleaf). Luck plays a role in determining the outcomes and individual players will tend to play according to their inherent risk preferences. Keep an ear open for sweeping statements and messages that are dangerous, unethical, and untrue. Use these comments as opportunities to reflect on important issues. It’s important to highlight that the game is highly simplified, and that real life is far more complex, with many more factors influencing decision-making. 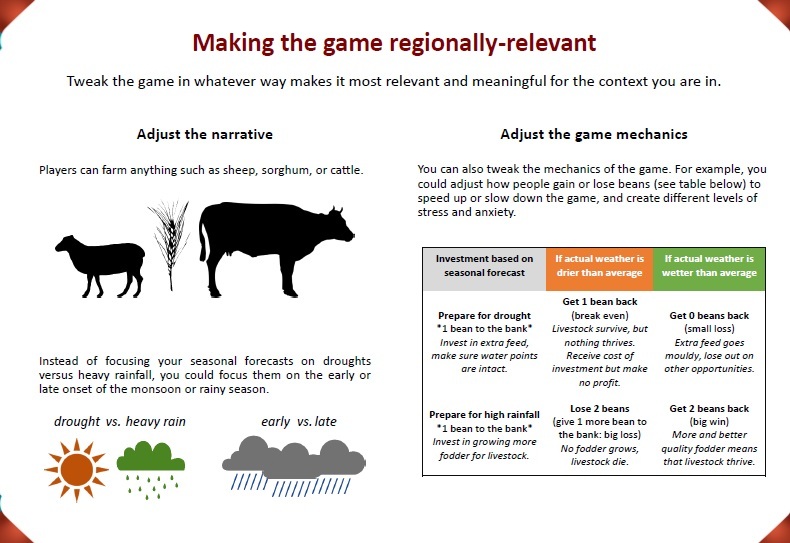 The true value of the game emerges when you relate it to real life contexts, so during the reflection process it is crucial to discuss and explore the connection between this game and sustainable and resilient farming practices. Tweak the game in whatever way makes it most relevant and meaningful for the context you are in. Adjust the narrative: Players can farm anything such as sheep, sorghum, or cattle. Instead of focusing your seasonal forecasts on droughts versus heavy rainfall, you could focus them on the early or late onset of the monsoon or rainy season. Adjust the game mechanics: You can also tweak the mechanics of the game. For example, you could adjust how people gain or lose beans (see table below) to speed up or slow down the game, and create different levels of stress and anxiety.